When the powerful waters of Niagara Falls appeared to freeze over a few weeks ago in January, it both dazzled and mystified the Internet. This beautiful wintry phenomenon attracts major attention even though it seems to happen every other year. 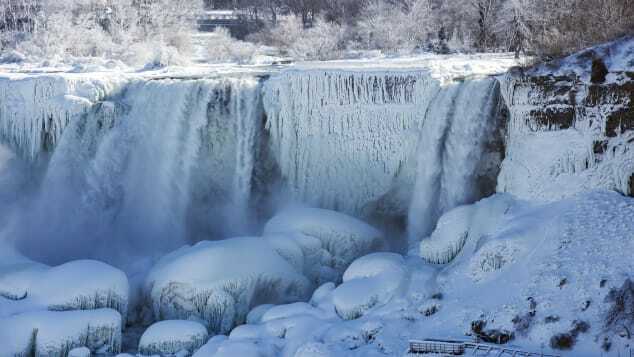 Each time, science-minded reporters and officials love to point out that Niagara Falls can’t ever freeze completely. Aldeyjarfoss Waterfall, Sprengisandsleið, Iceland: You can get close to Aldeyjarfoss waterfalls on your own, but guides are recommended for visitors as weather and road conditions are temperamental. Travel to Iceland in winter to catch the Northern Lights at night and you’ll have plenty to do during the daytime, too. All those dramatic landscapes become covered in snow and ice and there are plenty of glaciers, frozen tunnels, ice caves and waterfalls to explore. 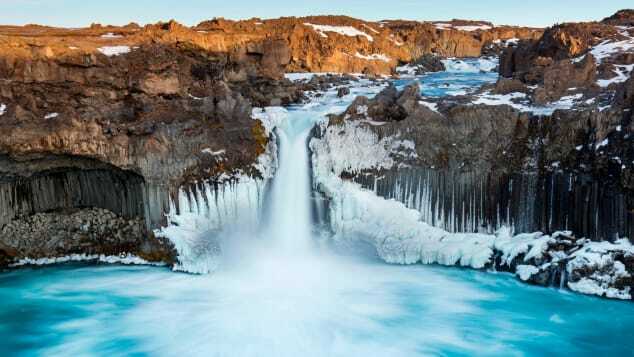 One winter stunner is Aldeyjarfoss waterfall, just north of Vatnajökull National Park in the Icelandic Highlands. 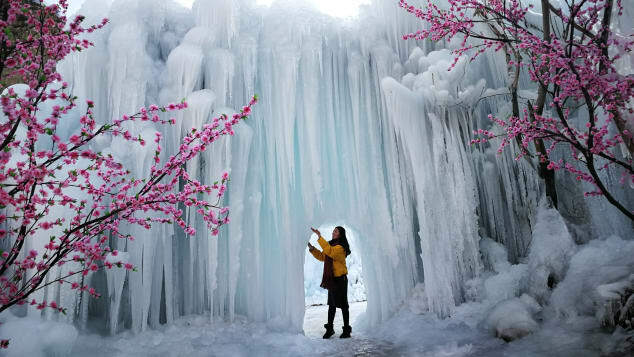 It’s 20 meters (66 feet) tall and both the rushing water and the lake below partially freeze for weeks at a time. The surrounding Húsavík area has a number of pretty waterfalls, but this one is a local favorite because of its black basalt columns. Some 9,500 years ago lava flows here cooled into hexagonally-shaped columns, and now they’re a stunning dark contrast to the bright white ice. Dawson Falls is one of seven waterfalls on Murtle River. Winter temperatures can fall to 10 F (-12 C), turning much of the normally rushing water into mounds of aquamarine ice from December through March or even early April. Each waterfall offers its own unique winter scene thanks to rocks from an uneven flow of lava here some 200,000 years ago. Most of the park’s viewpoints, roads and trails are kept open and clear throughout winter, and four of the most scenic winter falls are visible on a self-guided driving tour. When Lowell Fountain first froze over in 2002, park workers cut off the frozen bits for safety reasons. Now they let the water freeze over as long as it can. In 2002, Dan Biederman, executive director of the Bryant Park Corporation, decided to try a then-zany idea to keep the water flowing at Lowell Fountain in New York City’s Bryant Park. While most fountains in the city shut off for safety (or to avoid frozen pipes) during the winter, Biederman thought the sight of all those empty fountains collecting trash looked depressing. So, he kept the pipes at Bryant Park running with heated water. 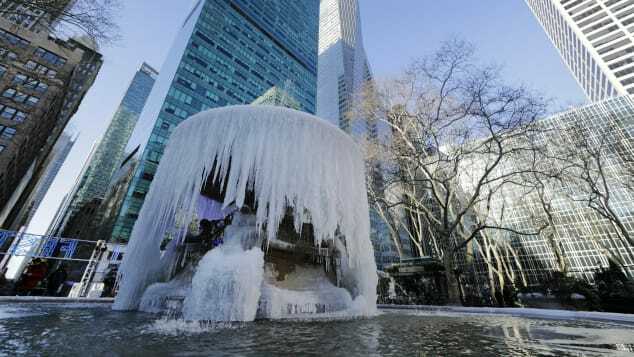 When a cold snap hit, the water flowing out of the fountain slowly froze, ultimately taking the shape of a massive crystalline cuff. It’s such a sparkly sight that a steady stream of photo-snapping visitors have turned it into an Instagram sensation. The winter scene at Bryant Park has made it a year-round tourist attraction. Along with the (frozen) fountain, there’s also Frost Fest, a shopping area and an ice rink with its own winter pavilion. It’s all a stone’s throw from New York City’s top tourist attraction, Times Square. Sunrise over a frozen Lake Superior, with Grand Island’s ice curtains in the foreground. The scenes of cascading ice at the Pictured Rocks National Lakeshore in Michigan’s Upper Peninsula are courtesy of an extraordinary natural phenomenon. Water seeps up and out of the sandstone and freezes in cold temperatures, coating the cliffs and caves in cloaks of ice along this part of Lake Superior. 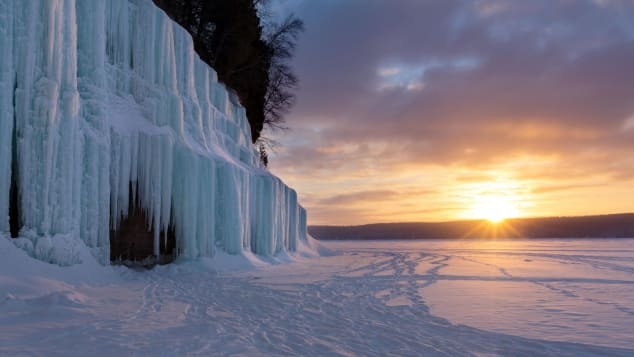 The surrounding Munising area averages around 140 inches of snowfall every winter (sometimes topping 200), and its 17 freezing waterfalls and ice caves (popular among ice climbers) have drawn new visitors. Conditions are advertised regularly by the Munising Visitors Bureau, which also offers information on ice tours and guides. Downwind Sports offers ice-climbing adventures for pros and brave beginners alike; its ice-climbing festival is a February highlight. 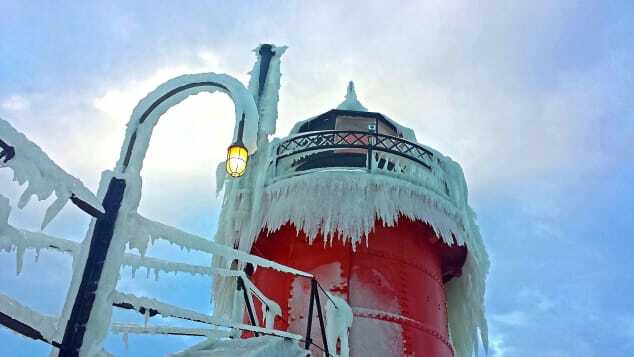 The lighthouses of Lake Michigan, Michigan: You’ll want to layer up and consider donning thermal underwear before you venture out towards South Haven’s Pierhead Lighthouse, as temperatures on the water’s edge often drop to 0 F (- 18 C). Lighthouses along lakes and oceans are picturesque no matter the season, but winter adds a nuanced look. Michigan’s lighthouses are special. Winds, picking up the water’s waves as they move west to east along Lake Michigan’s edge, can cause water to crash onto piers and splash the lighthouses. As the structures are colder than the water itself, the spray freezes instantly before it has a chance to run off the structures. Braving the chilly air and slippery piers to photograph some of his favorite spots along Michigan’s coast, writer Aaron Cruz documents all of this beauty for his site, elATLboy. Before visiting, check out Awesome Mitten for other activities in the area and find a lighthouse tour on the West Michigan Tourist Association site. An ‘ice bridge’ at the bottom of the falls forms when ice chunks pop up and out of the pool, creating a glacier 80-100 feet thick. More than 45 million gallons of water run over the falls every minute. In March of 1848, that massive flow stopped entirely. The dead silence was so unusual, a few brave people living nearby left their houses to see what was going on. Millions of tons of ice had blocked the water at the falls’ source in Lake Erie and the resulting thinned-out stream froze entirely. Today, another total freeze is possible but extremely unlikely as a 1.7-mile-long ice boom is installed each year to prevent this from happening. Still, smart people flock to the falls knowing long bouts of cold will freeze ice along the river’s edges, catching and clumping together until the whole massive cascade redesigns itself for winter. In addition, the massive amount of mist here travels everywhere and coats everything, says Anthony Annunziata, president of the Tourism Partnership of Niagara. That means the entire park area becomes an icy adventure land. Temperatures don’t usually hit freezing in Paris, but when they do, it’s a good time to check out the fountains in Place de la Concorde. Temperatures in the City of Light rarely dip below 35 F (2 C). When snow hits, it can snarl the city and wreak havoc on transportation. Still, colder months are a wonderful time to take advantage of cheap flights to the French capital, and you’ll likely see a quieter version of Paris. If you find yourself there during a cold snap, head to one of the city’s iconic fountains. 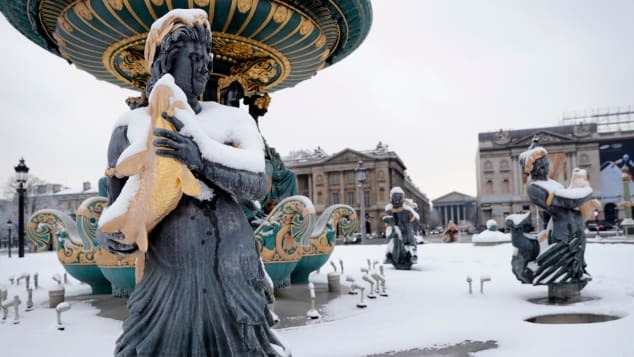 The Place de la Concorde and the Fontaine de L’Observatoire will suddenly transport you to a scene from “Frozen,” with hooves, manes and flaring nostrils decorated with daggers of ice. Traveling through Europe? Be on the lookout for stunning winter photo ops of other fountains, like Manufaktura Fountain in Łódź, Poland, the Giant at Swarovski Kristallwelten in Austria, and the Queens Garden fountains at Kingston-upon-Hull in Yorkshire, UK. Waterfalls in Mimishui scenic spot can drop 93 meters down. It’s in Pingshan County of Shijiazhuang, capital of north China’s Hebei Province. Mimishui Scenic Area is a favorite ecological tourist area in Pingshan County, about 95 kilometers from Shijiazhuang city. The area is home to more than 500 different kinds of plants. The clear spring water cascades down in spring and summer but forms curtains of ice in winter. When they freeze over, however, they become walls of turquoise and white ice. Colored lights highlight parts of the falls during an annual ice lantern festival each December, and this place becomes the photo spot of the season. 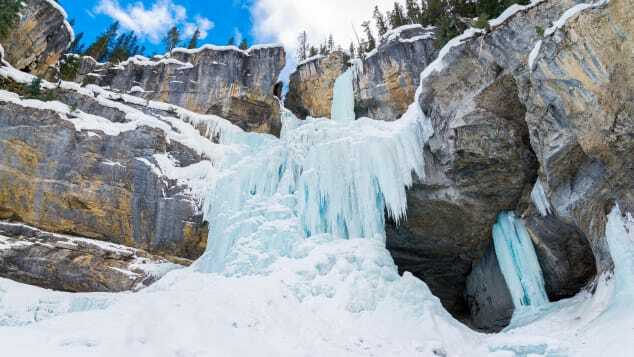 Panther Falls at Banff National Park is just one reason the Canadian Rockies are a mecca for ice climbers. 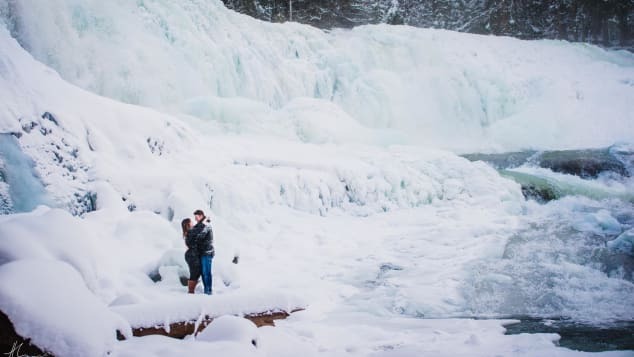 Banff National Park is known for spectacularly powdery slopes and excellent skiing, but a winter hike offers a different kind of winter journey via calming views of frozen creeks and waterfalls.